Genetically modified organisms have permeated much of the crop industry, absolutely infesting the processed food market, but are many ‘health’ supplements free from the presence of GMOs? As it turns out, major supplement producers actually will openly admit that they derive many of their formulas from GMO crops — consumers just aren’t really paying attention! As you may or may not be aware, wildly popular substances like vitamin C are usually extracted from corn — one of the leading GMO crops in the US. It is from this that the question immediately comes into focus: could supplement makers be using GMO corn to create vitamin C supplements? What about the countless other formulas that can extract from GM foods as a source. And when you consider GMO-containing ‘food’ can legally be labeled as ‘natural’ under current regulations, what ‘natural’ supplements could be based on Monsanto’s GMO crops? As it turns out, this is indeed the case. While it is impossible to compile a full list without a large amount of financial investment for testing every brand, what we do know is that major producers have explained how they usually will list ‘Non-GMO’ on their GMO-free options. In other words, chances are vitamin C may be extracted from GMO corn unless it is stated to be organic, non-GMO, or specifically not extracted from a non-GMO source. In reality, many reputable supplement companies have already begun listing their high quality products with the ‘GMO-free’ label and other quality re-assurances. Some, however, continue to source GMO or ‘potentially GMO’ corn. If you’re like me, this is a gamble that you are not willing to take. An interesting statement when also considering that NOW sites on the council for the Non-GMO Project. But what does this mean for the industry? NOW products are taken by thousands (or more likely millions) of health conscious individuals worldwide, and are considered to be of higher quality than many other brands. Now, to be clear, I am not bashing NOW and ignoring other brands. I really have nothing against NOW in particular, but their openness to GMOs within their products is truly problematic. Just imagine the quality of sourcing for pharmacy vitamin C brands that contain more fillers and additives than imaginable. But what do we do with this information? What do we do about it? Quite simply, it’s time to raise the standard. 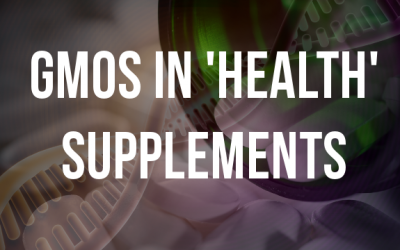 It’s time to let people know that their supplements are being sourced from GMOs, and it’s time to change that. This article is going to make a lot of manufacturers mad, possibly to the point of threats and exile, but this issue is more important than hurt feelings. We can’t sit idle while Monsanto creeps its way into the supplement industry, relishing as many health conscious consumers think they are aiding their bodies. The answer to the GMO sourcing within the supplement industry is a consumer-mandated shift towards non-GMO alternatives. Not ‘natural’ or ‘potentially GMO-free’ alternatives, but certified non-GMO, preferably organic-containing, health products. Sure, non-GMO certifications have room for error. It’s possible that some sketchy businesses can even slip past the regulations (particularly when considering cheap Chinese certifications), but it’s a start to progress the process forward as well. We are not even at the point where we can further accelerate the validity of GMO-free certifications when people aren’t even aware that they are consuming them in the first place. First, we need to blast this information out and E-mail every major supplement brand and ask if they ever source from GMO crops. Ask them point blank, and post the result in the comments, your blog, Facebook, Twitter, everywhere. Blast it out, get it out there. Force them to change or lose sales. Force them to begin sourcing 100% non-GMO or face massive customer loyalty changes. We’ve seen this work time and time again, which companies removing everything from BPA to high-fructose corn syrup in a bid to retain customers. We’ve even seen this with civil liberties issues going public and turning into a demand for answers from government officials. It’s an aggressive way of raising the bar, but it’s also essential to eliminating GMOs from this fairly new arena that virtually no one is talking about. It’s possible to cut this issue at the root as long as we make it a big deal. Monsanto’s GMO contamination has no place in our supplements, food, or really anything else. your soul. And idiotism too..
Oh how literate you just are. Try to read the comment on which you comment first. Why the need to be CYNICAL? Oh I forgot. It is deeply in your soul. And idiotism too. Theres too much going on now in the industry for every company to go gmo free. It takes time to make the changes from batches of suppliers to others. Many top companies are scrambling to make changes. There arent enough growers right now to cover them all. Gmo caught all by surprise. Most didnt know how Chemical companies were taking over farmers by making gmo seeds until it was in mass production after years of experiments. It was covered up until it became large enough that people in natural industry saw it. Now most are back peddling. Im sure big companies will try to please both sides to keep profits up. Time will tell who goes all non gmo, and will more non gmo farmers step up? They are desperately needed if we want the companies we love to go 100% non gmo. They work though. And very adsorbable too. I love them. MegaFood are really good. Expensive yes. Solgar was bought but another company about 2003/2004? Someone like Rexall. Not positive on the company. But they used to be a superb company up till then . Used Solgar in the 70's -thru the early 2000's. They have changed and I don't trust them. When I called NOW about 2 yrs ago, I was upfront, directly told NOW could not certify their Vit C was GMO free. They did not say they sourced their Vit C from corn grown in GMO free countries. Quite the contrary, they led me to believe they used American corn which is almost all GMO. I believe, at the moment, that Solgar brand claims to be GMO free. Some other brands online make that claim, too. "Thank you for contacting Solgar, Inc. Although Solgar strives to avoid using raw materials that contain Genetically Modified Organisms (GMO) in the formulation of our products, it is sometimes impossible to be completely GMO-free due to fluctuations in the availability of raw materials. Though certain ingredients may contain materials from genetically modified crops, our Quality Control laboratory follows stringent specifications for qualifying raw materials. If you have any further questions, our Consumer Affairs Representatives can be reached toll-free at 1-877-765-4274, Monday through Saturday, 9am-7pm EST. We look forward to serving you in the future. What you saw was an irresponsible fabrication: our vitamin C is not derived from GMO corn, and that blogger was actually told that it was from standard â conventional – corn. He chose to ignore that and then to falsely associate American corn with vitamin C manufacturing. Pure natural vitamin C is produced from corn by only five production facilities on earth. None are in the United States, where GMO corn is all too common. They are from Europe and the Far East, situated in countries that (to date) have restrictions that do not allow GMO corn to be grown there. We have audited our suppliers and when we tested our vitamin C for GMOs, none were expected and none were detected. We have done all that is currently possible to assure that it is non-GMO, and continue to press this issue with our vitamin C producers in hopes of eventual certification. A world-wide supply chain produces purified materials on a large scale, drawing from many farms without a system for documenting the agricultural practices used to produce the crops. Unfortunately, the supply chain documentation for such purified ingredients does not yet extend all the way to the farm level to allow full non-GMO certification. New and separate supply streams with full documentation of non-GMO status, from conversion and certification of farms through various handlers and processors all the way to the finished product manufacturers, are required for non-GMO certification and these usually take years to develop. It’s a very slow and complicated process to put even just part of the genie back in the bottle, but we are working on it every day. Prominent members of the non-GMO community have recognized us as pioneers in requesting, sourcing, and introducing non-GMO alternatives as they become available. We are proud to now have many non-GMO products for sale, having led the industry in offering non-GMO vitamin C, vitamin E, soy lecithin, soy protein and texturized protein, etc. We are committed to living in a GMO-free world, and have accordingly committed substantial resources to achieve and promote that goal. " So straight up guys here. Please don’t believe all the hype that’s on the Internet; that charge is untrue! We never said that we use GMO corn to make vitamin C; in fact, we told the blogger that we use standard (conventional) corn. He ignored that and then compounded his error by incorrectly assuming that we used American corn, laden with GMOs, but that’s not true either. Obviously, this blog did not utilize good journalism since it ignored all the important facts. Pure natural vitamin C is produced from corn by only five production facilities on earth. None are in the United States, where GMO corn is all too common. They are from Europe and the Far East, situated in countries that (to date) have restrictions that do not allow GMO corn to be grown there. We have audited our suppliers and when we tested our vitamin C for GMOs, none were expected and none were detected. We have done all that is currently possible to assure that it is non-GMO, and continue to press this issue with our vitamin C producers in hopes of eventual certification. Unfortunately, the supply chain documentation for such purified ingredients does not yet extend all the way to the farm level to allow full non-GMO “Identity Preserved” verified certification. NOW was founded in 1968 with the philosophy that “natural is better” and we accordingly have a firm commitment to Natural, Organic, and Wholesome (NOW) foods. Accordingly, our policy is to avoid GMO foods. Our championing of non-GMO ingredients encourages and motivates ingredient suppliers to commit to non-GMO products. How has NOW been a leader in promoting non-GMO? • We’ve supported The Non-GMO Project for years by providing scientific experts to serve on its Technical Advisory Board. • We have supported other non-GMO proponents, including the Organic and Non-GMO Report and the Institute for Responsible Technology. • We have long supported national, uniform, mandatory labeling of GMO foods and continue to work with industry groups on finding feasible ways to do this. • We have repeatedly publicized data showing that GMO crops are inferior nutritionally and agriculturally to their conventionally grown related strains. Prominent members of the non-GMO community have recognized us as pioneers in requesting, sourcing, and introducing non-GMO alternatives as they become available. We are proud to now have many non-GMO products for sale, having led the industry in offering non-GMO vitamin C, vitamin E, soy lecithin, soy protein and texturized protein, etc. We are committed to living in a GMO-free world, and have accordingly committed substantial resources to achieve and promote that goal. Thank you for bringing this to our attention Anthony. Just found out that Vitacost brand supplements may contain GMO. Another brand that cannot ensure its non-GMO status is Detoxitech. This info might save some of you the legwork on emailing those 2 companies. After I was recently diagnosed with 20+ food allergies, I've been avoiding GMO for the past 3 years and learning to grow my own food. Acerola cherry, rose hips, and Tart Cherry are all natural sources of Vitamin C, and can also be purchased in suppliment and powder forms. The farm soils of the US are depleted of minerals and N-P-K does not cut it. Through photosynthesis, plants are able to produce vitamins, amino acids and enzymes, but they cannot produce minerals. If the minerals are not in the soil they won't be in the plant. Farmers raise crops by the bushel, not by the mineral content. Farmers have found that they can get the bushel amounts with just Nitrogen-Phosphorous-Potash aka Potassium. Many other minerals are needed for proper health, hence the supplimentation. It's sad for our future that many of these large co-op farms care more about money than health. Buy Organic, Buy local, Buy at farmer's markets. It will be a lot cheaper for your health, than big Pharma drugs, as your get older. http://vitamincfoundation.org is valuable to me. Please visit it & enjoy. Thank you. Why do some people type in all upper case? Some say it`s a form of screaming. I think they are angry and passionate about how serious this problem is. Oh. I find screaming to be non-productive. It even turns some people off. megafood brand vitamins are all whole food sourced and labelled non-gmo. expensive, but what price your health? Were you all aware that organic pear and apple growers are allowed to spray ANTIBIOTICS on apples and pears to fight firebright? Isnt the industry that the usda supports great! Isn't USDA Organic always non-GMO? Thank you Anthony for bring this topic up. It is a tragedy the most consumers are ignorant of the existence and dangers of GMO products, but it is doubly tragic that those who are aware and who seek to maintain superior health using vitamins in their protocol are being victimized again. A Chiropractor made me aware of the fact that many companies use Corn as a source material for Vitamin C. I too was using NOW brand C. I e-mailed NOW and got the same response. Now I am back tracking on all of my supplements to avoid GMOs. By the way Now sells a lecithin and a non GMO lecithin. I searched for organic lecthin and it is 5 times the price. We all assumed the vitamin supplement industry was interested in the health of it's customers and now we find it is just another business. Very sad. If the vast majority of a crop is grown with GMO, and there is only a tiny amount from heirloom seeds, it is naive and perhaps disingenuous to think that non-GMO products are not going to be alot more expensive. If you can afford it, then by all means buy the certified non-GMO. In the case of Vitamin C there are non-corn sources available, but again you will find them much more expensive. If more people can spend the extra money, then over time the market can change but it will not be easy. i appreciate knowing the truth! what about seed packets, which ones can we buy that have no GMO's? also beware of fillers. most dextrin, dextrose or cellulose can be from GMO's, as well as the capsules themselves… and I would be willing to bet that Bayer has GMO corn in it's aspirin. and probably other aspirins. I am not able to take allergy medicine because of all the allergens and awful ingredients. be aware. childrens ear infections. YES, CHILDREN!!! BIG PHARMA, MONSATO, CONAGRA, GMO`S, ANTIBIOTICS, GROWTH HORMONES, STEROIDS, FLUORIDATED WATER. My life is over due to CIPRO. DO RESEARCH! An aspirin a day will eat away at your stomach lining and cause internal bleeding. It is also not that good for your heart. If you take it to thin the blood because of High Blood Pressure, you would be better off getting on foods that help the heart and work towards lowering blood pressure. Look on the net for foods for HBP. I will say, that an aspirin will help in an emergency in case of a heart attack; proven on an old dog I used to have who was having a heart attack. He lived another 10 years. If you are alone during a heart attack; forced intermitten, but continuous coughing will work the heart almost as good as CPR, while you are waiting for help or going to the hospital. Thanks so much for writing about this – I have been contacting all of my supplement makers and asking about the use of GMO ingredients and have been shocked at how I'm either ignored or told that they do in fact contain GMOs. It's like whack-a-mole to try to avoid these ingredients! In what sense is NOW Foods "not a quality manufacturer at all"? Please provide details. Thanks. for POISON IVY! I`ve been bed-ridden w/chronic joint and muscle pain, deterioration and wasting for 4yrs. (google cipro side effects or this site). Someone had mentioned antibiotics being used on pears and apples earlier. I`ve been trying to rebuild my immune system and detox this horrific chemical w/ these supplements. which is a side effect of the CIPRO!!! meaning, they are putting these toxic chemicals, like GMO`s and FLUORIDE, everywhere. ANTIBIOTICS, GROWTH HORMONES, STEROIDS, the 1st poster is not paranoid, this is genocide, we are being poisoned, for the almighty $$$. The problem is that they are finding new and improved ways to hide these things from us. Neotame can be added to USDA organic and Kosher foods WITHOUT being labeled! Are there any supplements that are GMO free? It is frightening that we are being poisoned under the guise of health. I'm not shocked, just sickened. All of the soy milk, tofu and tempeh that I see is USDA Organic and / or non-GMO Project Verified. On the other hand, none of the soya lecithin that I see is labeled as such, so I must assume that it does contain GE soy. I wonder why this is. Swansonvitamins.com sells Lecithin labeled Non-GMO. Egg yolk (preferably Organic) has a higher and better quality lecithin over soy any day. Eggs, the most perfect food, does not need to be fermented. If soy is not fermented it is detrimental to human and animal health. The Chinese learned this over 3500 years ago. They had plenty of slaves, prisoners, and peons back then to practice on and prove this theory. No, I do not represent the egg industry; I just eat them for health…..over 72 years now. I never cared for egg yolks. I rarely eat eggs, but when I do I discard the yolks. When others say, "The yolks are the best part", then I offer to give the yolks to them. They always decline. How about you Dave? Should I save my yolks for you? [ Smiles ] I think that I would be better off getting my vitamins the natural way by consuming natural organically grown foods!